Earn $97.50 in Rewards credit (9750 points) What's This? Cannondale’s 2019 Bad Boy 1 Urban Bike features an alloy frame, rigid lefty fork, 650b wheels, and integrated USB-rechargeable front and rear lights. Striking a balance between forward-leaning and upright geometry, this bike delivers both performance and comfort. Frame Material: SmartForm C1 Alloy, integrated Urban Armor bumper, BSA, 1-1/8" headtube. Fork: Lefty LightPipe rigid, integrated SuperNova LED lightstrip. Rear Derailleur: Shimano Alfine 8-speed internal gear hub. Crankset: FSA Comet, w/ Gates Belt Drive 46t. Brakeset: Shimano M396 hydro disc, 160/160mm. Handlebar: Bad Boy, 6061 Alloy, 31.8, 720mm x 15mm rise. Stem: Bad Boy Si, integrated sandwich stem, 60mm. Saddle: Fabric Scoop Radius Elite. Seatpost: LightSkin w/ integrated rear LED light, 31.6. Wheelset: Bad Boy C1, 650b. Rims:Bad Boy C1, 650b, double wall w/eyelets. 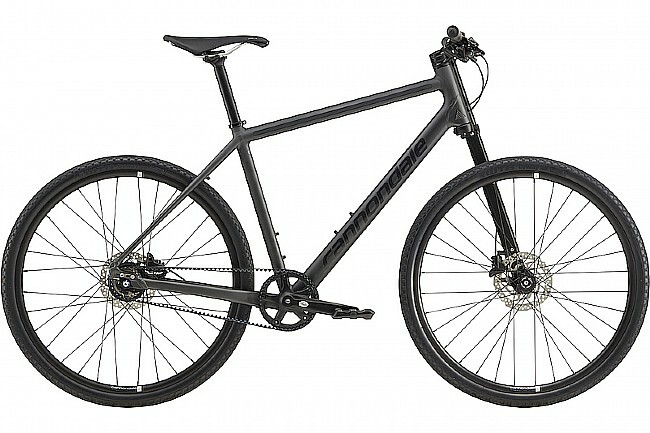 Hubs: Lefty 50 front, Shimano Alfine 8-speed internal rear. Tires: WTB Byway, 650x40c, folding.